On Eve Of 2nd Trump-Kim Summit, Is North Korean Reactor Producing Plutonium? Days before President Trump and Kim Jong Un are to meet in Vietnam, satellite images show no river ice downstream from the key North Korean facility at Yongbyon — a sign the reactor may be running. Satellite images of the Yongbyon Nuclear Research Center from Planet, a San-Francisco based company, indicate the main 5-megawatt reactor on the site is running, according to Jeffrey Lewis, a scholar at the Middlebury Institute of International Studies at Monterey. "It's really business as usual at Yongbyon at the moment," Lewis says. "People show up for work, and material comes in, and it looks pretty much like it's looked for the last 10 or 15 years." But without on-the-ground inspections, it's impossible to tell exactly what's happening, and others are not so sure the reactor is switched on. "If I had to bet, I'd say it's most likely not operating," says Frank Pabian, an imagery analyst with 38 North, a website focused on analysis of North Korea. The questions surround what appears to be melted river ice downstream from the reactor. Images taken most recently, on Feb. 19 and Feb. 22, clearly show a lack of ice, and water flowing from a cistern attached to the reactor's cooling system. Lewis believes heat from the operating reactor is likely melting the ice. Pabian, meanwhile, thinks the melting could be a natural result of the river's rapid flow just south of the reactor. He says there are other signs the reactor isn't running, such as a lack of steam coming from an adjacent turbine building. Pabian and Lewis agree that the Yongbyon complex has remained busy throughout the winter with vehicle traffic. Roads are clear, and buildings are occupied. Even though Pabian questions whether the reactor is running, he emphasizes there is no way to know for sure what the North Koreans are up to without independent inspections of the site. "I won't be sure until we have boots on the ground," he says. Of course, Lewis notes, even if the reactor is running, North Korea has made no specific promises to give up its nuclear weapons or facilities. After the Trump-Kim summit in June, the North committed to "complete denuclearization of the Korean Peninsula," but it offered no timeline for when or how that would happen. Satellite imagery since then has shown missile bases are being expanded and sensitive facilities are continuing to operate in the run-up to the second summit. "The North Koreans have refrained from doing any missile and nuclear testing, so that's good," says Jung Pak, a former CIA analyst who worked on North Korea and is now a senior fellow at the Brookings Institution. Pak says in general, there's plenty of evidence suggesting that North Korea is continuing "to produce ballistic missile parts and produce fissile materials." The continued activity at Yongbyon is particularly noteworthy because it is the most prominent nuclear site in North Korea. Construction began in 1961, and the complex has expanded ever since. Long considered a crown jewel of the North's weapon program, the site is host to multiple reactors, a giant facility designed to extract and purify plutonium and a separate, newer facility filled with centrifuges for enriching uranium. Plutonium and uranium are both used in nuclear bombs, and material from Yongbyon likely makes up some of the "triggers" for the North's most powerful thermonuclear weapons. Siegfried Hecker, a former nuclear weapons scientist now at Stanford University, is one of the few Westerners who has visited Yongbyon. He made multiple visits, most recently in 2010, and describes many of the facilities as Spartan and antiquated. During one January visit, he says, "It was colder inside the buildings than it was outside the buildings." On other trips, Hecker saw scientists growing their own vegetables in fields near the site and using primitive safety equipment while working in potentially dangerous areas. But he is convinced that Yongbyon is effective at producing material for nuclear weapons. "These facilities may be old, but they're functional, and the people are professional and very competent," he says. In recent statements, Kim has indicated he might be willing to give up part or all of the Yongbyon complex in exchange for loosening sanctions and perhaps a peace declaration between the U.S. and North Korea. If that were to happen, Hecker says it "would significantly curtail [North Korea's] abilities to continue the nuclear weapons program." But, Hecker adds, it would just be a first step: "It doesn't mean they're giving up their bombs, because I'm quite certain the bombs aren't at Yongbyon." Hecker estimates North Korea's current nuclear arsenal at several dozen weapons that are stored somewhere else. North Korea is also believed to have other covert facilities where it can make uranium for nuclear weapons. On top of all that, it's not clear what "giving up" Yongbyon would mean. 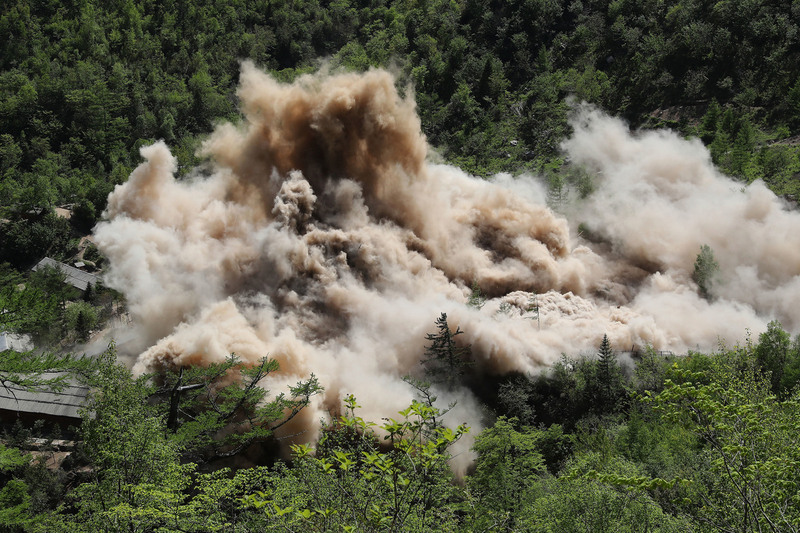 Last year, North Korea closed its underground nuclear test site at Punggye-ri by dynamiting the entrances before the eyes of foreign journalists. But foreign inspectors were never allowed to examine the site first, a critical step in proving whether it really was shuttered for good. In May 2018, North Korea blew up its test site at Punggye-ri in front of the international media. But foreign inspectors did not get a look. Pak says that North Korea is paranoid about foreigners. "North Korea does not want people running around their country looking at their missile facilities or their nuclear facilities," she says. But Yongbyon is a big, technically complex site. Unlike Punggye-ri, it can't just be blown up. Pak believes that any U.S.-North Korea deal should include inspections. "It would be a big change and a good signpost of North Korean sincerity of denuclearization if they allowed inspectors into their facilities," she says. It remains unclear just how far the North is willing to go. Speaking last month at Stanford University, Stephen Biegun, the State Department's chief envoy on North Korea, said that Kim had promised the complete dismantlement of all North Korean nuclear facilities if the U.S. took "corresponding measures". "This complex of sites that extends beyond Yongbyon represents the totality of North Korea's plutonium reprocessing and uranium enrichment programs," Biegun said. But in brief remarks to reporters last week, President Trump seemed to have more modest expectations for the upcoming summit. "I think a lot can come from it — at least, I hope so — the denuclearization, ultimately," he said. "I'm in no particular rush.